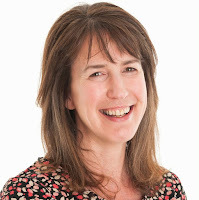 Today’s post is based on a recent presentation by Duncan Tannahill Managing Director of the Tannahill Partnership and former CEO of Glasgow Chamber of Commerce. You can watch an abridged version of the presentation in the video below or keep reading. Very often businesses give away profit and opportunity without necessarily being aware of it. If they systemised their business their teams could run the business more effectively and generate larger profits. 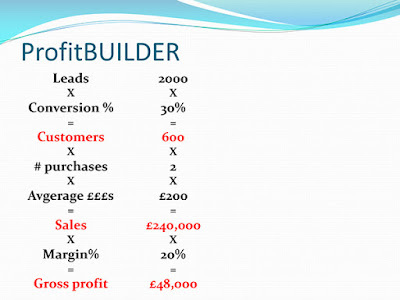 To achieve this Duncan Tannahill uses a model called ProfitBuilder that looks at Leads, your Conversion Rate, number of Sales, the Average Sale Value, and your Margin. 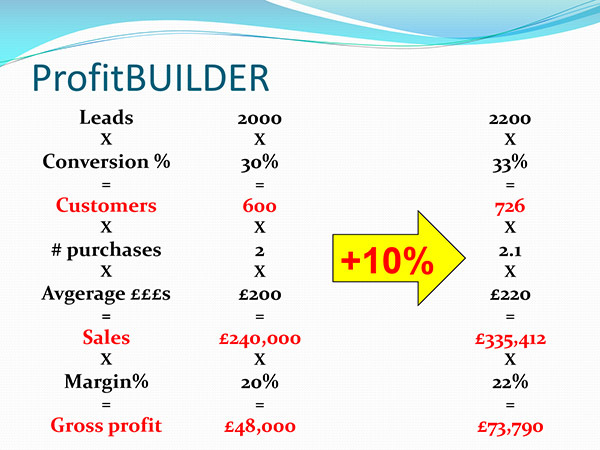 When you multiply all of these separate factors you arrive at your Gross Profit, as you can see in Duncan's graphic below. Now the left hand column is a bit like looking at equations in a maths class so in the right hand column we'll put in some numbers to make it look real. As you can see we have 2000 leads and we convert 30% of those leads into customers who each make two purchases with an average value of £200. That equates to a total sales value of £240,000. 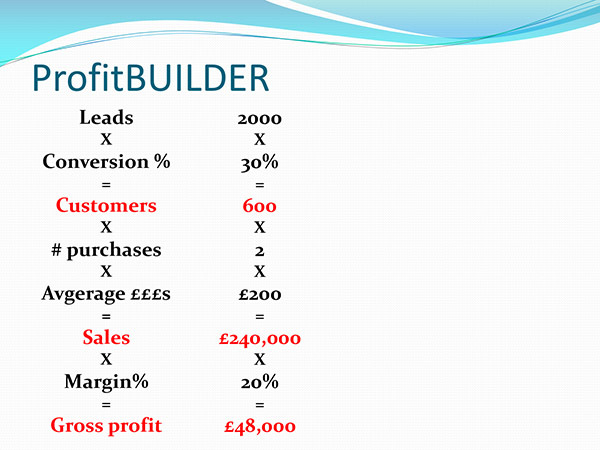 If we assume a margin of 20% that leaves us with a gross profit of £48,000. So what can you do with these numbers to make them grow and make the business bigger and better? Now what many business owners do not appreciate is that even a small change in each of those factors in black can make a huge difference to the Gross Profit. Really successful companies will drive those black items because they know what happens when you multiply each of those factors together you get a compounding effect. The increase in each factor might be small but multiply them together and wonderful things happen. Imagine we are able to increase each one by 10%, which probably is not unreasonable. So 2000 leads would go to 2200, your conversion rate would go up from 30% to 33% and so on. Those are all relatively small changes but what happens to the Gross Profit is that it moves from £48,000 to a staggering £73,790. What the graphic is telling us is that if we increase each of those areas by 10% the over all effect is sales will increase by 46% but the Gross Profit grows by a whopping 61%. It doesn’t matter what your business is or what your numbers are currently, when you increase them by 10 percent it has to come out at a 61% increase in profit on the bottom line. If you can drive just these five areas in your business you are on the way to growing your business significantly. Here we will look at improving just one of those areas, the average sales value. This in itself is likely to cause you alarm if you regularly discount in your business or if you have increased your prices you will be feeling quite smug in a moment. Every business has given a discount at some point. You know what happens, a customer takes a sharp intake of breath and tells you, “oh, that’s too expensive”. So you take 10% off the price. The trouble is you probably do not understand the consequence of giving that discount. When you give a discount you are giving away money and usually a lot more than you think. 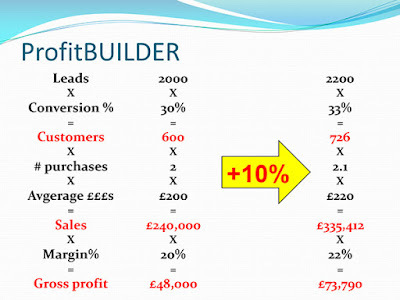 For example, say you are selling widgets for £100 and the cost per sale is £60 so you have a 40% margin. Now if you give away a 10% discount what happens is you are now selling the same widget for just £90, so your margin reduces to £30. So what have you effectively done in real terms by giving a 10% discount? You haven’t given away 10% of your profit, in fact you have given away 25 percent of your profit. 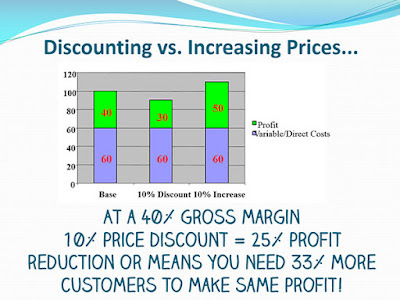 But more alarming, if you run your business by giving discounts you will have to go out and get more customers just to make the same amount of profit. In our example of a 40% gross margin and a 10% discount that is a 25% reduction in profit or you need a third more customers. So for every three customers you have you need a fourth one just to make the same money you would have made. 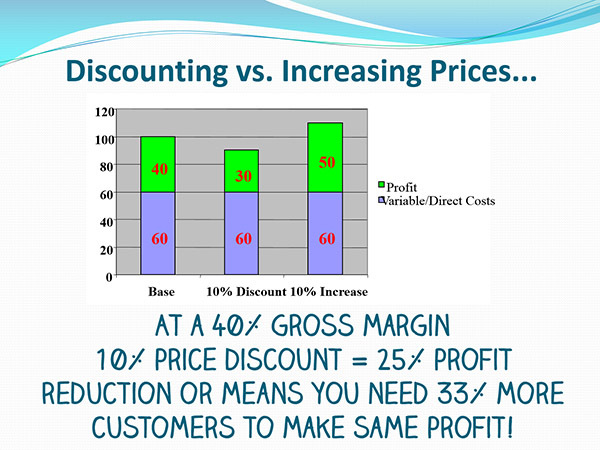 In contrast if you put up your prices by 10 percent, you have a $50 profit on a $110 sale so a 25% increase in profit and by definition you could have fewer customers and still make the same money. When you look at the consequence of making that 10% change, either up or down, you can see the actual change in your profit is magnified considerably. Understanding that can make a huge difference in your business so don't be so quick to agree to a discount the next time your customer asks for one. If you can avoid giving a discount you can stop that drip in the bottom of the bucket and make the bucket fill a lot quicker and therefore generate more profit more easily. Duncan Tannahill is available through his website or by phoning +44 1360 449 023. For Duncan’s E-Learning Marketing System click here.